- Select a soil sample from several areas of your garden. The pH can vary from one spot to another. Choosing several sites will give you a good average. Dig to a depth of 6 inches and scoop up a small sample of soil. Place the soil in a gallon-size plastic storage bag. Add the sample soil from each area to the bag. Seal the bag and shake to mix the soil. - Remove any bits of roots, leaves or other debris and discard. Spread the soil out on an old newspaper and allow it to dry. Measure 1/2 cup of the soil and add to a mason jar. Fill the jar to 2 inches from the top with distilled water. You can use tap water if you are sure the pH of the water is neutral, otherwise it will affect the results of the test. Close tightly and shake to mix thoroughly. - Allow the water and soil mixture to set until the soil settles to the bottom and the water is clear. Insert the litmus paper into the water. If the litmus paper turns red, the soil is acidic; if it turns blue, the soil is alkaline. The litmus test will not indicate the degree of acidity. To determine the exact pH of the soil, you will need to purchase a soil test kit (see Resources below). Follow the same procedure for gathering soil samples. Add the capsule from the soil kit to the soil and water mixture according to the directions with the kit. Shake to mix. Compare the resulting color to the color chart provided in the soil test kit, once the soil has settled and the water has cleared. Palm trees are popular indoor plants for winter gardens and staircases. 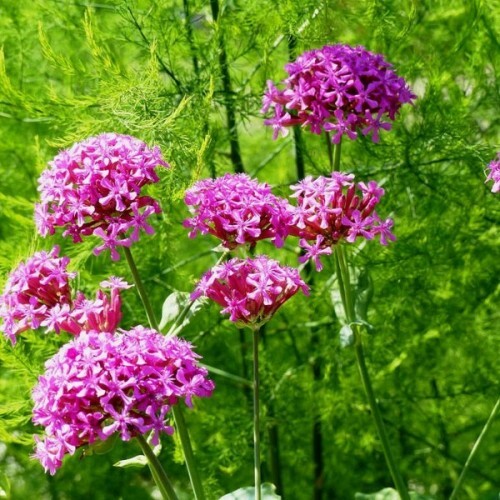 This mixture contains va..
Rear but easy to grow perennial flower. Blooms from May to beginning of July with clusters of pi..